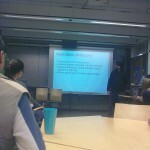 Yesterday I joined an ISS research seminar. I have been out of the loop in so many things while writing my dissertation including what is happening in here. Yes, I lived in a complete volunteer exile. So, it was enriching and help me to actualize to hear about the work of diverse colleges, such as what Hanna Vrzáková, Victor Gonzalo and Harri Karhu have been doing. Also the seminar allowed me to realized new game developments. I knew about their existence, but to hear from the developers its more enriching. Consequently, the session fed my energy on the preparation of my course on game design so that it can serve them 😉 Yes, I know, it is A LOT of work but I know it is WORTH it! As important is to understand the bottom-up situation of phenomena, as it is to raise one’s voice with police makers, i.e. pay attention to the situation from up-bottom. 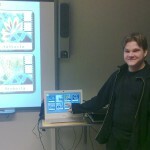 Indeed very interesting after–seminar talk! 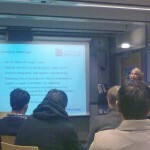 This entry was posted in conference & seminar and tagged finland, photo on January 26, 2012 by caislas. 1) Digital technology is a powerful and fragile tool. One of the reasons why I see it powerful is because it can connect ideas, reflections, experiences, without physical boundaries. One reason why I think it is fragile is because without infrastructure (besides accessibility and know how) is useless. A pencil or even a crayon is less fragile than a mobile phone. For example it can survive better natural disasters than a whole wireless or electricity network require for a mobile phone to work. Things to think about…. 2) We see only what we want to see, and what media allows us to see. Earthquake: 30 Sept and 1 Oct – Earthquake Sumatra Padang. This one shocks me specially after I lived the earthquake of Mexico 1985, Yes, I have a trauma about it, but one can’t forget these type of events. This video of the land-sliding from the earthquake in Padang just freezes me, wondering if deforestation played a role. Typhoons: Late Sept. Ketsana hit specially the Philippines, Vietnam and Cambodia. Even countries with “strong” infrastructure are being affected as Japan with another typhoon. Those are only few tragedies, no idea how many are present. And yes I know natural disasters are always present, I shouldn’t get that surprise someone could say. … from what we are “allow” to see, we only see what we can see and want to see. 3) We have information about climate change through digital and not digital formats. But how many of this information indicates how to change our behaviors to diminish this. Wondering who generates most of the CO2? who are the ones who demand more raw material to produce “x”? Who are the ones who flight? who are the ones who waste heater and air conditioner in their houses? Who consumes most of the meat produced overseas? Who are the ones who use driers? who uses a car only for one person? how many products wrap with layers of plastic do we buy?, who produces most of the e-Waste? …. And when I find articles as “Debate Follows Bills to Remove Clotheslines Bans” I do not know if I should laugh or cry. Each one of our actions are like a grain of sand. One grain might look insignificant, but all together form wonderful beaches. The same happened with disasters. No related to environment, but related with lack of understanding to take proper action. This year I have 8 papers rejected in a row. I appreciate the referees’ feedback as they had stressed that focus is my main problem. I knew it, but I can’t fix it yet. Should I declare myself guilty too? *** All these makes me think…. It is not enough to get the information on how to improve something. It needs to be adapted to the reality of the listener, to support as much as possible the understanding of such information. Learners are smart, and if it is close to their ZPD they will do fine and get into proper action. But how can I change/improve “X” if the information that I seemed to understand is not linked to my reality?, less to the ZPD. The clearer this information is adapted to my reality, the possibility increases to get close to my ZPD, and then move in some direction instead to follow an inertia. It is not matter that others do my job or live my life, or lecture me about something. I want to understand how to improve and do things. I would imagine this happens with all the topics, and with all the persons. *** Do not give up…. If I succeed with myself one day, I am optimistic that maybe I could support others to success by themselves afterward. My research, baptized as Hypercontextualized Game, seeks to create awareness in-site about specific subject matter. It is paradoxical, right? I want to be an expert of my weakest side. Then, my conflict makes me feel helpless when I know with my mind and my heart that something must be done. I kind of figure it out a proposal to take action to solve something, but I can’t succeed to make my message clear neither match my actions with my intentions. 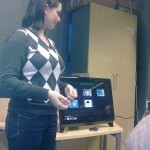 This entry was posted in nature and tagged crisis, link to, photo, reflecting on on October 11, 2009 by caislas. My believe is that all what surround us interacts with us at some level, but it is not that simple to listen to it or be aware about this. E.g. within humans we can find that some people is louder than others, then it is easy to hear (no necessarily listen) some individuals than others. The same happens with all what surround us. E.g. a flower can “talk” to us and tell us that it has not enough sun, it takes us some days to understand its message but it talks clearly about it. Of course a dog will be louder than a flower. Sadly enough, we humans are not train to listen to different frequencies and rhythms. We focus on our senses in a very narrow bandwidth (we make it even smaller than what it is). Even with our lovely technology, we are not “train” to listen to it carefully, give time to it. E.g. when suddenly one of our applications is not working in a way I expect, (aka it is not being interactive and friendly with me from my perspective), I can say: it does not work. Then patiently Mikko and Teemu say: “what is the system telling us?”. We go to different (debug) windows to see what our system complains about. Then the NO-INTERACTIVE system from MY perspective, actually is an INTERACTIVE system when we listen to it from another perspective. This starts to be interesting…. Maybe even Newton could fit here. His third law is my favorite one: “For every action, there is an equal and opposite reaction”. One of the main concept to understand within this law is friction. Btw friction is not a simple concept, but it is crucial in order to understand the balance of systems. How Newton could fit here? Well, in a very naive way I would say: all action has a reaction somewhere, not only in “physical terms”. Then, can we call that reaction is interactive? If interactive is “acting on each other”. This entry was posted in school and tagged interaction, photo, reflecting on on June 21, 2009 by caislas.